Forget everything you think you know about angels. Because in the world LA Weatherly has created, they are the enemy. Most angels live in another dimension, feeding from the ether. But their sustenance is disappearing, and now they are moving here, and feeding off the essence of humanity. There’s a small band of people trying to stop them. Alex is one of them. He’s an AK… Angel Killer… one of the few humans who knows how to spot them –and stop them. Angels have killed his entire family. And even though he is only 17, he travels the country alone, following one mission after the next. But things change for him when his AK contacts send him to kill Willow. She’s not a regular angel. She is actually a human-angel hybrid, the only one of her kind. And she has no idea what she is. Willow is aware she is different. After all, she’s been psychic all of her life. She didn’t even know angels existed until a psychic reading on a schoolmate tipped her off. Now the angels want her dead, because they see her as a threat. And Alex becomes her unlikely ally, as he hopes to use her for his cause. I was surprised at how much I enjoyed this book. The entire premise is refreshing and unique. I didn’t find it predictable at all, but the developments weren’t jarring or unnatural either. Both Willow and Alex were solid leads, sympathetic… with depth of character. I liked watching a relationship develop between them too. The whole “us against the world” dynamic is a powerful thing. However, the word “love” comes into play much too quickly here. It’s only a matter of days before the l-word is flying. This would have been much more satisfying and believable if Weatherly had waited until after the weeks in the cabin before throwing it out there. Maybe this is a YA thing. I don’t read much in the genre. My only other criticism is that it took me a while to get used to jumping back and forth from first person narrative to third. I don’t mind seeing things from both Alex and Willow’s perspectives. But I think I would have liked it better if it was in the third person for both. There was a lot of action and the book ends with obviously a great deal of story left to tell. This is the first part of a trilogy and I’m looking forward to finding out what happens next. Viva la Mexico! 4 stars. 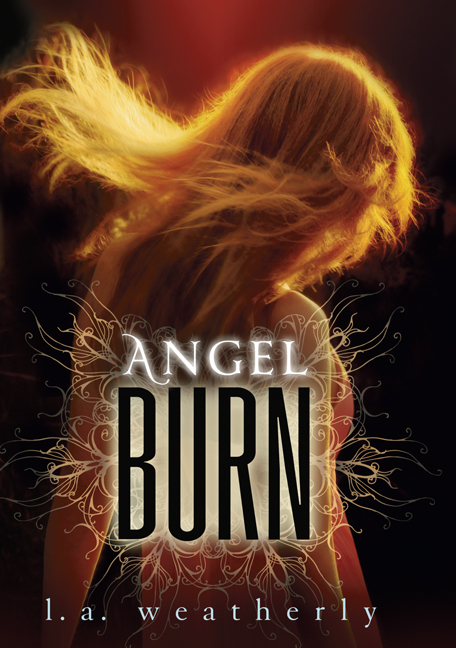 I got Angel Burn on audio at BEA but I hadn’t read any reviews on it. I’ll have to get to it one of these days! I like a good angel story.